SPRAYER DESCRIPTION: Sprayer which attaches to any garden hose and is controlled by an easy off/on switch on top. When pushed forward, the valve will be closed. When turned clockwise (straight up), the valve will be on and if the water supply is turned on as well, the sprayer will begin to spray. When closed, nothing will happen. When you want to make a chemical application using this sprayer, first add the product you want to spray. 1) Place proper amount of chemical (powder or liquid) into jar to make desired number of gallons to be sprayed. Fill jar with proper amount of water for gallons to be sprayed. This sprayer can be used to spray from 1-20 mixed gallons of solution. Once the desired amount of chemical and water have been added to the holding tank, stir well before reconnecting sprayer head (see mixture example). 2) Attach sprayer head to jar to prevent spillage. Firmly thread hose-end connector to the end of garden hose. Turn water valve (counterclockwise) to OFF position. This will be the forward position. Turn on water faucet. 3) To spray your mixture, turn the valve (clockwise) to the ON position. Valve must be fully open for best results. To shut off water turn back to the OFF position. HOW HIGH WILL THIS SPRAYER REACH? We get this question quite a bit. The answer is simple; however high you can reach with your garden hose and the water pressure at your house is how high this sprayer will reach. This means the reach height will vary from home to home. So for some who have very weak water pressure, you may not be able to get reach much above 15-20 feet. But for most all homes, it will be able to spray 20-25 feet up and for some, 30 feet or higher still. MIXTURE EXAMPLE: If chemical calls for 1 tablespoon per gallon and you want 5 gallons of finished spray, place 5 tablespoons of product into jar and fill with water to the 5 gallon mark on side of jar. CLEANUP: Clean sprayer and jar after each use to prevent mixture and contamination between different chemicals. Rinse jar and refill with clean water, and spray for approximately 1 minute. Yes. Its actually a good option; easy to use and very accurate. The product on this page is nothing but a hose end sprayer so I'm not sure which one you're asking about. But if you review our Tree Frog article, you'll see several listed. Your best option is the Pest Rid. Spray it on any plant the tree frogs will immediately leave. It can be applied with any standard pump sprayer and treatments generally last a month. For tall trees, use a fogging machine to apply it. Great Company! Product was very easy to use. Product was delivered as promised! Can this sprayer be used with Outslaught insecticide? Worked as advertised. I would recommend this product. Good quality. This product is very easy to use and made the application much simpler than other sprayers. 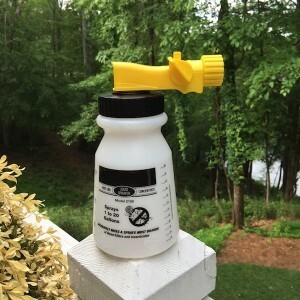 Will this sprayer work for a 50/50 bleach/water application to kill fungus on a roof. No. In fact, we're not aware of any hose end sprayer capable of spraying such a concentrated end mixture. Think about it. If you want a 50/50 mixture, you would need to add 1/2 gallon of bleach to 1/2 gallon of water. So even if this sprayer had a 1 gallon holding tank and you filled it with bleach, you would need the sprayer to disperse the entire amount by spraying just 2 gallons of water which it cannot do. In fact it will take 20 gallons of water to empty the tank so for every gallon of water you spray, it will only have about 1.5 oz of bleach. More importantly, bleach won't control mold. At best it might turn it light (bleach will turn many things white and take away the color) but it won't kill it. And the super low PH the bleach produces on the surface of the roof will allow the mold and algae to grow back very fast once the bleach is gone (which is usually within a few hours). It only takes a few oz of Mold Blaster per gallon of water and it will both kill and prevent mold/algae from coming back a lot longer. Typically you'll only need to use it once a year and you won't be seeing anything new growing if you follow that maintenance program. And you can use the sprayer above to make the application too. Nice sprayer. Easy to use for almost any chemical for the yard or garden. Great buy. Just what we needed to put out your product. Now we just hope it works! Easy to use. This sprayer is simple to attach to the hose and makes application of insecticide easier. How far does this spray? Needing to get to the tops of trees. The general rule on how high it will reach is based on how high your hose will spray when using any standard spray nozzle. This sprayer will use the power of your water pressure so the reach will vary from house to house. At my home, the pressure it quite high so I can spray it upwards about 30 feet. And with a little extra effort, almost 35 feet. But my parents old home had such weak water pressure, the hose could barely spray 15 feet.